Groß, mittelkräftig, sehr ausdrucksvoll. Gute Oberlinie, Kruppe sollte etwas länger sein, gute Vor-, sehr gute Hinterhand, ausgewogene Brustverhältnisse, gerade Front. Hinten gerade-, vorne etwas engtretend, Ellenbogen sollten etwas geschlossener sein, wirksamer Nachschub, guter Vortritt. Sicheres Wesen, TSB ausgeprägt; läßt ab. V. Ausdrucksvoller, durch sehr gutes Pigment auffallender Rüde, überzeugende Führigkeit und sehr gutes Griffverhalten. VI. Geeignet zur Verbesserung des Pigmentes, vor allem der grauen Farbe. Ebenso Ausgleichspartner für im Wesen etwas laue Hündinnen. I used a son of his to breed to a Cero Jivo daughter I kept back out of my breeding, and there is a pup from the litter that is a good resemblance of their grandpa Bomber, or what I think he would have looked like as a pup. Big boned, stocky and black as black can be with nice dark eyes. The pup is sweet as can be but has a tough side too. All the pups from the litter have very nice temperaments and drive to work. I look forward to seeing how the ones I am holding back turn out. Love Bomber, he is a stunning looking beast of a black German Shepherd. Bomber vom Wolfsheim is magnificent! I am so proud to have one of his beautiful daughters, Frederika vom Spitzenhund. It doesn't get any better than this. Finally a WL stallion with great conformation that can produce. Congratulations to the owner and breeder of this most excellent GSD. Good looking dog,nice pedigree to go with it. Guess we know who got the looks in this family. What a dog! Wonderful dog, i Have one of his sons IKE VON DER ALTE BAUM he is 9 months old and is very eagar to learn and highly intelligant. 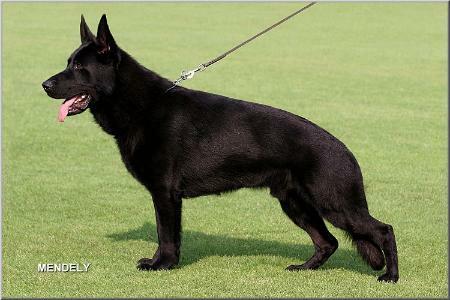 Beatifull all black GSD and i get wonderfule commets from everyone on him. looking forward to advance training this spring and hopefully follwo in his fathers foot steps. Beautiful dog, nice bloodlines. Would be interested in pups from this male! Handsome looking black dog! Owner & breeder should be proud!